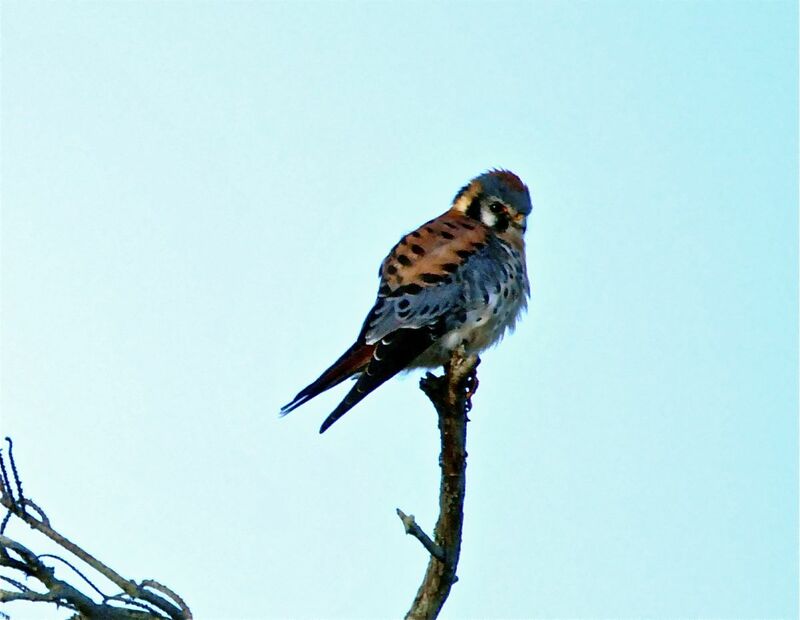 American kestrel, photographed at Loxahatchee National Wildlife Refuge, Boynton Beach, Palm Beach County, in January 2016. Few birds can match the American kestrel, Falco sparverius, shade for shade. It is one beautiful bird, with its mix of reds, whites, blacks and even blues. It is North America's smallest and most common falcon. Two subspecies are found in Florida, the northern, which is a winter visitor found throughout the state, and the southeastern, which is a year-round resident but has a more limited range. 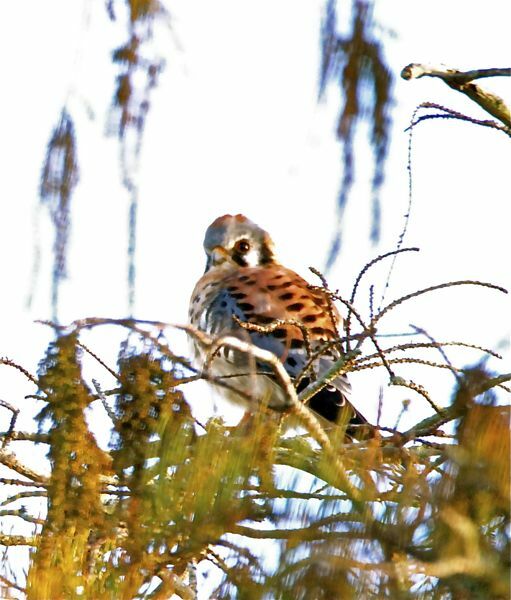 Florida officials list the southeastern kestrel as threatened. More on that in a bit. Kestrels can have a body length of only a foot or less, with a wingspan of two feet or less. They're slightly larger than a mourning dove. Kestrels have a roundish head; males have a blue-gray top, with a white face and black streaks that extend from the eyes almost like tears. The back is rust red, with a series of black dots. The wings are blue-gray, the belly white. Females are less colorful, lacking the blue gray and the whites are more buff. They are found throughout most of the western hemisphere, from above the Arctic Circle to Cape Horn, the extreme tip of South America. In most of that range, including most of the United States, kestrels are year-round residents. However, there are kestrels that migrate between the far north, where they breed in summer, to points south, including Florida, the Caribbean and Central America. This is the kestrel most likely to be seen in Florida, particularly South Florida. It used to be that southeastern kestrels, the nonmigratory subspecies, were found throughout Florida. Loss of habitat, however, has driven them from South Florida. Southeastern kestrels, like all kestrels, are partial to open habitats. They tend to be found in sandhills and savannas, places that are increasingly scarce in Florida. 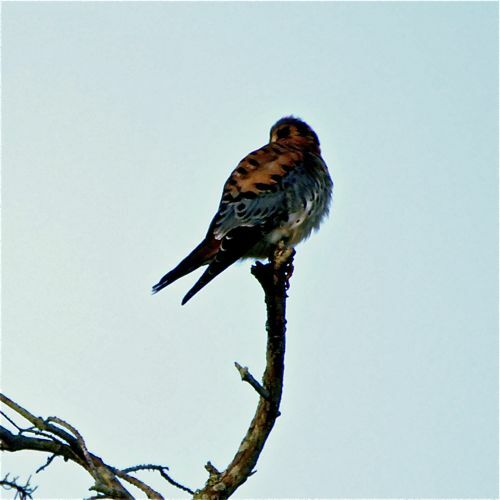 Kestrels can adapt to human-shaped habitats like farm fields, pastures even parks and golf courses. But they still require suitable nesting sites. When it comes to looks, both northern and southeastern kestrels are pretty much identical. The southeastern is slightly smaller than its northern cousin, but the Florida Fish and Wildlife Conservation Commission says its impossible to differentiate the two based on looks alone. The easiest way, is time of year. If you see a kestrel between May and July, its a southeastern kestrel. Northern kestrels have headed to points north by then. Kestrel nest in tree cavities or other nooks and crevices, natural or man-made. They do not excavate cavities but will use an old woodpecker hole for their home. They do not line the site either. The male picks several sites; the female makes the final choice. Clutches are usually four or five eggs, which take about a month to incubate; hatchlings require a month of care before they're ready to fly. Young kestrels will hang with their parents for a couple of weeks after they've fledged. Both parents care for their offspring. Kestrels do most of their hunting from a perch, scanning the ground for a tasty grasshopper, lizard or rodent. Birds, frogs, snakes and lizards are also on the menu. They'll also take prey while in flight. American kestrels are members of Falconidae, the falcon family.